Lenny Leonard pointed out that this is the first time The Skulk have come to the ring without their trainer A.R. Fox with them, making their shocking victory over Catchpoint at Evolve 110 a "graduation" of sorts. Ruff held his own against Jaka very well, causing Jaka to get frustrated. Chris Dickinson was apparently frustrated by this as well, as he came out and attacked the Skulk members on the outside, which distracted Ruff, allowing Jaka to hit him with his finisher and get the win. POST-MATCH SEGMENT - Fine. Dickinson & Jaka beat up Leon Ruff and Adrian Alanis of The Skulk, who challenge them for the tag titles tomorrow night. A.R. Fox came out to make the save, but once Jaka & Dickinson retreated, Fox was attacked from behind by Austin Theory. Theory laid Fox out, then cut a promo to build up to his (dark match) main event against The Velveteen Dream later tonight. This was a fun tag team match. Kincaid and Fa�ade, who have been teaming in DDT, looked very good and were pushed by the announcers as a potential addition to the tag team division. Unfortunately, at this point, Kincaid feels like he has almost no connection to the Jason Kincaid whose story for the past two years has seemed like it was setting up for a major payoff but at this point seems abandoned. Kincaid & Fa�ade won, and Gacy attacked Pena after the match. They agreed before the match to not chop each other and just have a straight wrestling match like gentlemen. Harlem, of course, broke the deal, and Drake made him regret it. These guys got a surprising amount of time and had a surprisingly competitive singles match. The story of the match mostly revolved around the Cutie Pie Club using their 2-1-1 numbers advantage. Kelly won with Osteoporosis. They succeeded in getting me interested in tomorrow's SHINE 53. STOKELY HATHAWAY JUMPS THE GUARDRAIL - He wants to be the new ring announcer but is escorted out. The idea here is that Stokely is in denial about losing his EVOLVE career last month. They told the story of Davis' power vs. Williams' technique, with Davis making one critical mistake by abandoning his game plan to go for a moonsault, which missed and Williams rolled him up with La Magistral for the pin. POST-MATCH SEGMENT - Fine. Davis laid Williams out with a lariat and told him "you may have won the match... but I won the fight" which he had also told Anthony Henry after a similar situation last month at Evolve 109. Dickinson jumped Briggs from behind on his way to the ring, including getting a chairshot in before the match officially started. They had a brawl and took some scary bumps, including Briggs chokeslamming Dickinson onto the side of the steps. Briggs got the win, which feels like a big step up for him. While the Skulk was at ringside with Fox, including a new female member, Ayla Fox was not. The announcers kept asking how not having Ayla at ringside would affect Fox, as if he hasn't wrestled without her at ringside for most of his career. The match was going very well, with both men working the neck... and then we got a ref bump and a completely inexplicable heel turn by first the Skulk and then Fox along with them. They've spent months building up this feud between Fox and former trainee Austin Theory and now they turn Fox heel the night before their big match? Hell, it was just earlier on in this match that Lenny Leonard was pointing out the difference between Theory and Fox's other trainees being that the Skulk don't interject themselves into matches like Theory has done... and now here are the Skulk doing just that. The worst part about this, though, is that it felt so unimportant. Everything they did here- the ref bump, the Skulk heel turn, the Fox heel turn, the belt shot- all felt like it happened just to allow Janela to kick out of something surprising and to allow Penelope to get her sh*t in by beating up the Skulk (thankfully Leon Ruff and Adrian Alanis, who are getting the tag title shot tomorrow night, were not represented here, as having the two guys getting a tag title shot in twenty-four hours and four of their friends get beaten up by one person would be a whole different level of stupid). This felt like exactly the sort of pointless "let's do it because it will get a pop" sh*t that you see all over the indies that I absolutely f*cking hate, and now my one bastion of sanity is doing it, too. 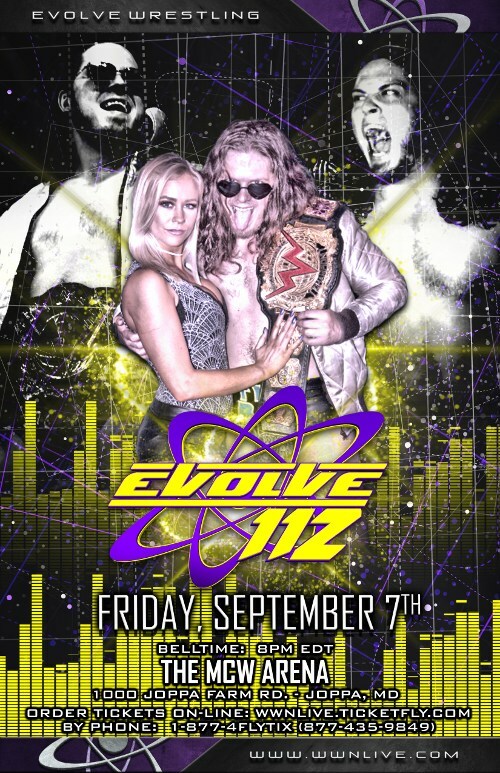 This was an odd show from EVOLVE. I've already gone into what I didn't like about the main event, but the rest of the card also had a kind of "off" feeling to it. And I know that sounds odd because all of the matches were good to great (with Darby vs. Henry being pretty awesome) and the stuff they did was mechanically "good" for the storylines, but at the same time the show just felt... empty. Between the various recent departures (Lee, Riddle, Zack, apparently Thatcher) and other guys who just weren't on this show (WALTER, Strickland, Al Sabah, Garrini... although maybe Garrini is gone now that Stokely is gone) the show just felt... empty. It feels like everything Gabe has done to elevate the new guys (Henry, Drake, Briggs, Skulk) has worked and the guys they brought in tonight all played their parts well and had good matches, and yet aside from Darby, the newer crop of guys don't really feel like they're on course to reach the level that the current crop of top guys are on, and I'm honestly not sure why (and doubly so in the case of Drake and Henry, where I always look forward to their matches). The product is still good, but it doesn't quite feel exciting anymore. Janela is good, but his presence really makes EVOLVE feel like any other indy, and Davis is also very good but just isn't exciting. They have the talent to turn things around- both in the ring and behind the scenes, but it feels like not only are they not there yet, but they're not even necessarily facing the right direction. Hopefully tomorrow's show beings to change that feeling.